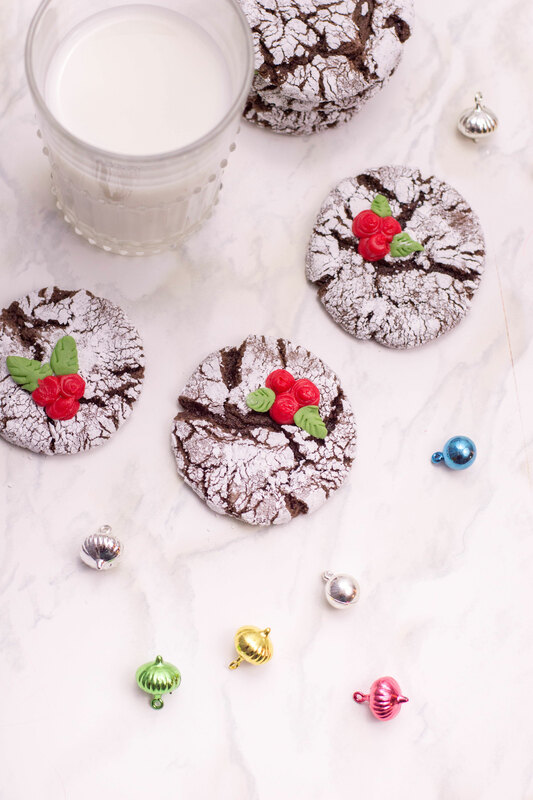 Giving my favourite crinkle cookies a holiday makeover. The perfect addition to any Christmas sweet table. Well, another Christmas season is fast-approaching and I still have yet to participate in one. 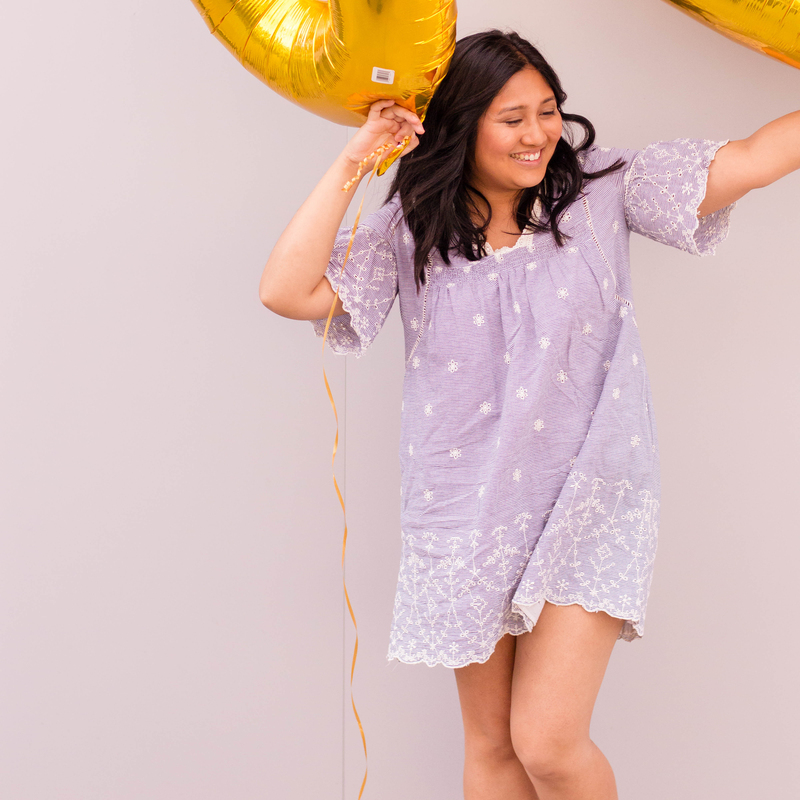 Instead, I have teamed-up with a group of fabulous bloggers for a Cookie Blog Hop and I can’t wait to show you what they have up their sleeves! Today, I’m sharing the recipe to my oh-so sweet and oh-so easy crinkle cookies. These crinkle cookies are actually made from a cake mix with a few tweaks to the recipe. All it takes is some simple ingredients (that are most likely already in your pantry!) and a bit of imagination. In a bowl, mix together chocolate cake mix, canola oil, and 2 eggs. Wrap the bowl with plastic wrap and chill for 30 minutes. Remove from the refrigerator and preheat your oven to 350 degrees F.
Roll each cookie into 1 inch spheres and coat with granulated sugar, followed by the powdered sugar. Place on cookie sheet, about 1-2 inches apart. Bake for 9 to 12 minutes and allow to cool completely before decorating. To decorate, use a round frosting tip to create 2-3 circles on each cookie. Roll 36 small spheres out of your green fondant. Flatten the fondant spheres, giving each a pointed end. Use scissors to cut out a leafy-edge. On the back of each fondant leaf, frost out a bit of white decorating frosting. Secure 2 on each cookie. Now, the moment you’ve all been waiting for! 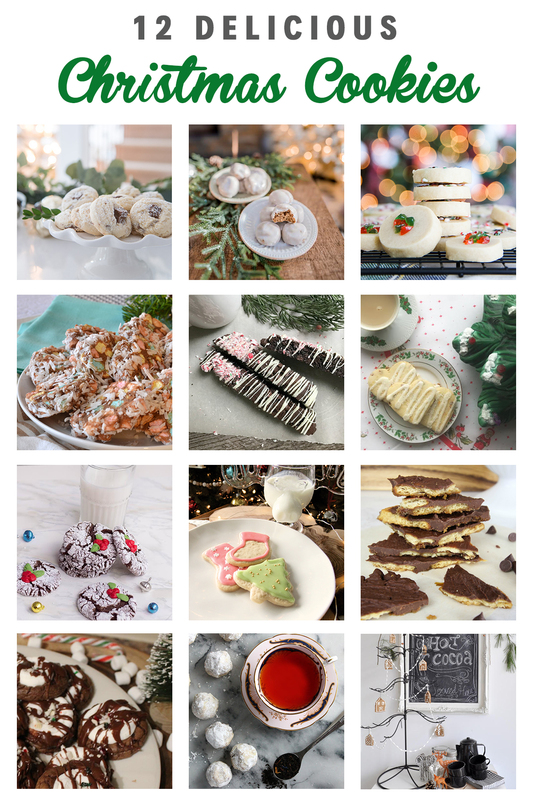 I teamed-up with a group of my favourite bloggers and I am so proud to present their delicious cookies… perfect for the holiday season! These cookies look delicious. 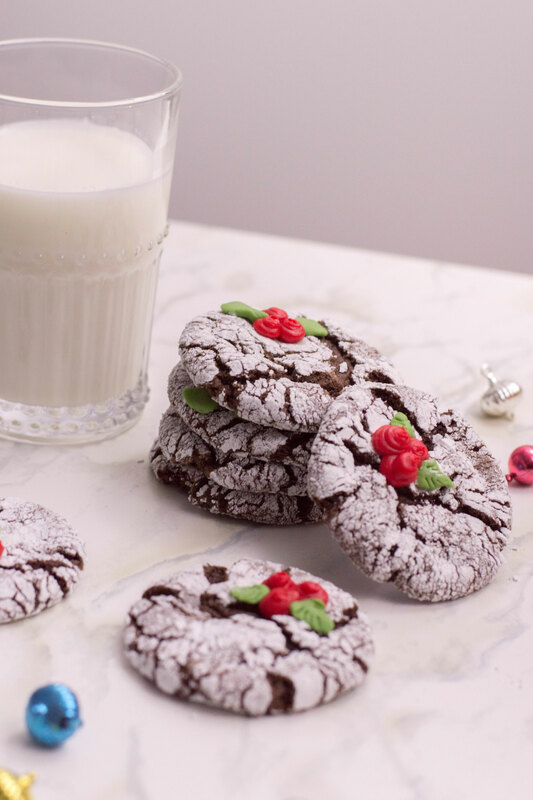 Using a chocolate cake mix makes it easy to make these cookies. Thinking I could use different cake mixes for different flavors. Those look absolutely gorgeous! I love crinkle cookies it brings me back to my childhood when my grandma would make cookies for me. I love what you did with these! Yep, these are very cute cookies! The little berry leaf on top takes it to the next level. These are a cute cookie, and they look so tasty! You would be a great addition to any cookie exchange. These look so good and i would try and make them before the season is over. I’ve always wanted to try making these cookies. They would be so much fun to bring to a holiday party. Yum, I love how these turned out. They sound amazing. And they look pretty. It’s been ages since I’ve had crinkle cookies. What a delicious collection of cookie recipes. We’re not doing a Christmas cookie holiday swap this year as we’ll be out of the country during the holidays but I am sharing this post with my friends and bookmarking so I can make some when we return. Oh these are cute. 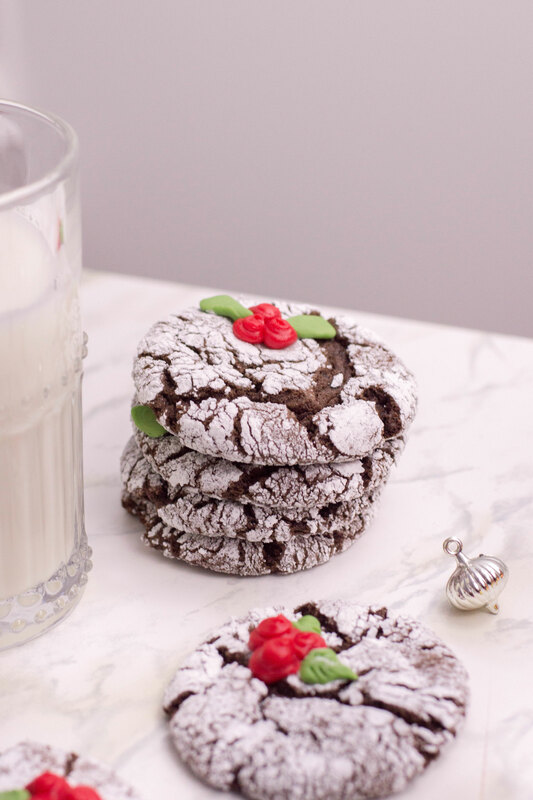 I can’ believe I’ve never made a crinkle cookie before…that’ll have to change this year. These cookies are so darling and elegant. The holly decoration is so unique and came out great! These are so pretty Lisa! I love the little icing holly berries! I make these too! They’re so good and everyone in my family enjoys them. Your pictures are beautiful. Amazing and so cute! Thanks for the recipe! Ok, now I want some cookies. Those looks so yummy and so festive too! 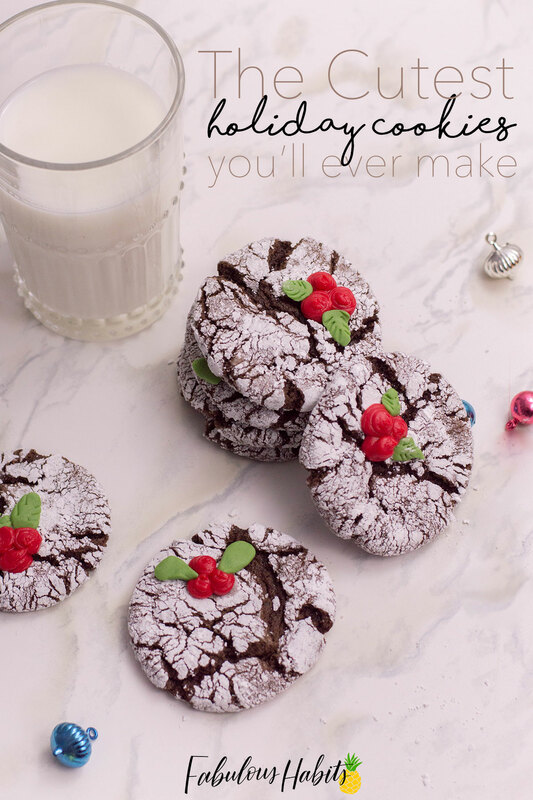 I see these cookies every Christmas and always wanted to try them, now I have the recipe! Thanks for sharing, they look delish. I like a good crinkle cookie. And I love that these are made from simple ingredients that I have on hand like cake mix. I want to try to make these for the school’s holiday party. Those are incredibly cute. I love crinkle cookies (second only to snickerdoodles!) and I want to make some that look like yours! These are some of my favorite Christmas Cookies to make. I love how you dressed them up for the holidays! These cookies almost look too good to eat! Almost! I love the decorations on top! All of these cookies look so yummy!! I want to try them but they would be so bad for my diet…LOL! !